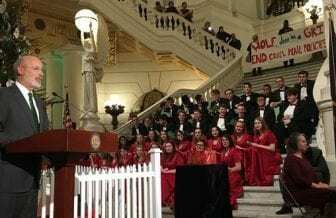 HARRISBURG, PA (WSKG) — A group of protesters from two inmate advocacy groups crashed the pomp and circumstance of the state Capitol’s annual Christmas tree lighting Thursday to protest Pennsylvania’s prison mail policy. The policy was tightened in September after a series of drug smuggling scares. Now, all mail is sent to prisoners by way of a processing facility in Florida, where it is photocopied. Inmates no longer receive the originals. Wolf plowed through his prepared remarks, and he and First Lady Frances Wolf pressed the ceremonial button to light the Christmas tree without a hitch. Speaking to reporters afterward, the governor said the mail policy changed for a reason. The protesters were from Philadelphia, and are part of the groups Decarcerate PA and the Coalition to Abolish Death by Incarceration. Lorraine Haw was among them. Her son is 25 years into a life sentence at the State Correctional Institution at Smithfield. She said she understands many people may not get why photocopied mail is an issue. But for her, it’s huge. The mail policy changed after prison staff reported feeling sick after contact with supposed synthetic drugs. The state chapter of the American Civil Liberties Union is suing Pennsylvania for a different component of the policy: the status of legal mail. It is also photocopied, and the prison retains originals for a short time. The group argues that could allow prison staff to read or tamper with sensitive letters.